If you’re in the market for a high-end, large-screened Samsung device, your best options are now the Galaxy S9 Plus and the Galaxy Note 8. The differences between the two phones might be obvious — only one has the S Pen — but there is more to the picture than meets the iris. What might be most exciting about this comparison is looking at how the current Galaxy S line could influence the Galaxy Note 9 release later this year. The designs of the S9 Plus and Note 8 are actually quite different, and not simply because of their size. While both phones share an 18:9 aspect ratio, the Galaxy Note 8’s 6.3-inch screen is almost too tall for some people. The S9 Plus’ screen is still a Super AMOLED Infinity Display, but it is just a bit smaller at 6.2 inches. It is only when one turns the phones around that the similarities and generational changes are obvious. The Galaxy S9 Plus brings the dual lens setup for the first time to the S line of phones, while the Note 8 started it last year with the addition of a zoom lens. Thankfully, the Galaxy S9 Plus' fingerprint reader is comfortable to reach. Things are slightly shifted around on the S9 Plus, with the cameras stacked one on top of the other. That is due in part to putting the fingerprint reader lower on the back. Thankfully, the Galaxy S9 Plus fingerprint reader is actually comfortable to reach. The cameras are a big upgrade in the Galaxy S9 Plus, and not just with the secondary lens. Yes, there is a telephoto lens on either phone at f/2.4 aperture but the main lens of the Galaxy S9 is the really exciting prospect. Built into the mechanics of the lens is a closing and opening iris, providing two physically different apertures — much like a full-size camera lens. This allows for different levels of light and depth of field, affording the super wide f/1.5 aperture setting to bring the bokeh, while the f/2.4 closed aperture facilitates wider frames. The aperture changes automatically according to the situation or manually in Pro mode. The Note 8 features a single f/1.7 aperture lens that still does a good job of capturing good pictures. As with most things camera-related, you’ll only really know how much better this can be for you, or if it makes no difference, once you’ve tried it for yourself. The cameras are a big upgrade in the Galaxy S9 Plus, and we’re not talking about the secondary lens. While the Note 8 arguably represents the best of the old guard, the S9 Plus’ camera performance only gets better with what Samsung is calling multi-frame processing. Samsung is already known for its high processing power, but with DRAM now on the actual camera module itself the camera app is able to shoot a dozen photos simultaneously. These are then used in groups of four in order to figure out the contrast, detail, and noise which needs to be processed. Even ignoring the mechanical iris, this high level of processing is a huge improvement. The S9 Plus also a number of new modes, like Super Slow Motion and AR Emoji. Super Slo-Mo is obvious to figure out. It shoots 960 fps video at 720p resolution, making for some really dramatic footage. Even better, the camera app can automatically figure out when the motion is happening so users don’t have to do the guess work. AR Emoji is just for fun. The front-facing camera makes a caricature of your face which you can then customize with hairstyles of various colors, some clothing options, and plenty more. Hit “save” and the phone will automatically generate a bunch of GIFs you can immediately send to anyone you want. You could also just go AR crazy with the front-facing camera and record a video or take pictures of yourself as your emoji. These camera modes are basically exclusive to the Galaxy S9 family, at least for now. But the Note 8 will definitely feel a step behind without the mechanical iris and enhanced image processing. That said, it has its own differentiating feature. With so many capabilities baked into the stylus and its software, the Note 8 is still an incredible productivity machine. Use the S Pen as a sort of mouse for precision and easier item selection, write notes using methods like Screen-Off Memo, or just use it to draw on all the things. The S Pen software itself provides a ton of impressive capabilities, including the ability to take a long screenshot of a scrolling page and then draw all over it if you want to point out various elements within the saved screens. The Note 8 has one up on the Galaxy S9 in the GIF realm with Live Message. Write a message using the S Pen and you can send the animated writing to people. It is about as personal a touch as a stylus allows a user. You could probably call Live Message the Note 8 equivalent to the AR Emoji. Then there’s Bixby, which gets enhancements on the Galaxy S9, which will probably make it over to the Note 8 eventually. The Bixby camera can now discern different types of food, works well with more vendors for shopping applications, does live translation, and can even help someone try out makeup via AR. All of this is accessed either in the camera app or via the Bixby button, still on the left side and at the ready for accessing Samsung’s assistant. FYI, the Bixby button is still just for Bixby. The S9 and S9 Plus now have stereo speakers: on the bottom and in the call speaker. The headphone jack hasn't gone anywhere either. As I’ve said in the past, the Infinity Display still stands out one of the best ways of consuming media. Super-wide aspect ratios make for really great full screen video content and the high saturation of Super AMOLED makes for a really vivid experience. The Galaxy S9 Plus moves it a step forward with enhanced audio. The S9 and S9 Plus now have stereo speakers, one on the bottom and one integrated in the call speaker. Together, they make the phone 1.4 times louder than previous releases, especially with the Dolby Atmos enhancements turned on. The speakers get plenty loud and the audio sounds fuller. For those who want a more private listening experience, the headphone jack hasn’t gone anywhere either. The rest of the phone is very Samsung, with few surprises other than the ones we have already detailed. 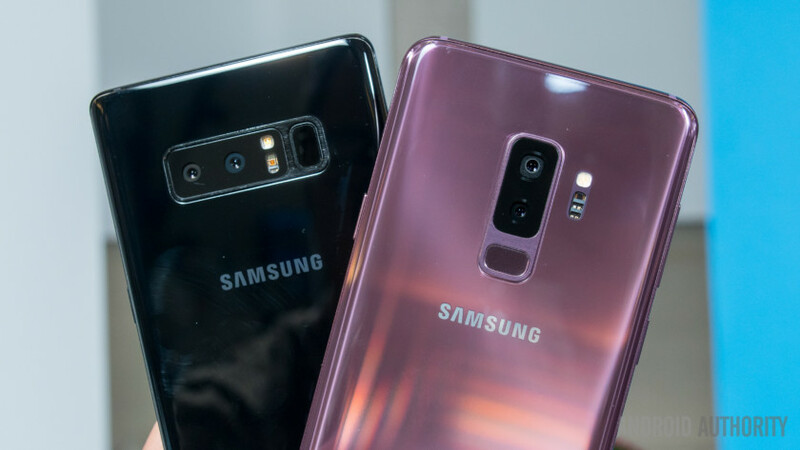 Glass-on-glass designs with different colors are fairly standard these days, though we were quite taken with the new Lilac Purple version of the Galaxy S9 Plus. Performance gets the expected bump up with the Snapdragon 845, but the S9 Plus also closes the small RAM gap by bringing 6 GB compared to the smaller S9’s 4 GB. Onboard storage on the Galaxy S9 phones stay at 64 GB but all of them include microSD card slots. The Galaxy Note 8 is now the middle child in terms of battery life, sporting 3,300 mAh battery, between the 3,000 and 3,500 mAh units of the Galaxy S9 line. With the addition of dual cameras to the S9 Plus, the only thing really differentiating the larger S Series device from the Note line is the S Pen. With the addition of dual cameras to the S9 Plus, the only thing really differentiating the larger S Series device from the Note line is the S Pen. The enhancements that the Galaxy S9 Plus introduces make sense for an iterative update and they lay the groundwork for what we’ll see in the Note 9 later this year. If you’re not all that fussed about the new camera stuff, the Note 8 is not at all a significant downgrade from the S9 Plus. It also has all the added benefits of the S Pen. Of course, the Note 9 launch is not all that far away now either. The most exciting parts of the S9 Plus are its dual speakers and mechanical iris – features that will surely find their way to the next Note device too, perhaps even better than we see them here. The Galaxy S9 is available for pre-order starting March 2 and users throughout the world can trade in their current phones to get a deep discount on the new phone. If you trade in a Note 8, you can get the maximum discount. But if you have the Note 8, you might already be a loyal fan, meaning the Galaxy S9 is just your glimpse of what’s coming in your Note 9 future. How excited are you about the new Galaxy S9 and beyond? Let us know how you feel and stay tuned for more great coverage from Mobile World Congress!